The following examples illustrate active learning strategies we can help you employ. 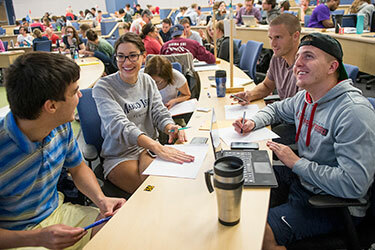 Traditionally, students spend class time listening to lectures. Then they struggle alone with how to apply what they’ve learned; it’s homework. A flipped classroom turns that around. Students get lectures outside of class, often by watching online videos. In class, they struggle with and apply what they’ve learned through lively activities among peers with guidance from the instructor. 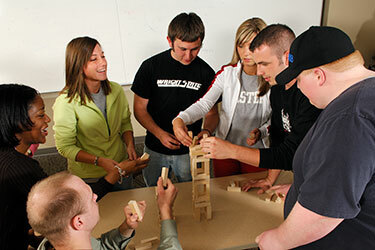 With this strategy, students collaborate to solve a problem, often as a course-long project. The problem is carefully chosen to stimulate student interest, engender controversy, and provide an authentic model for a real-world problem. To solve the problem, students synthesize ideas, make decisions, resolve controversies, and defend the feasibility of their solutions. For more information on problem-based learning, see Designing Problems to Promote Higher Order Thinking. With an emphasis on creating cohesive teams from diverse groups, team-based learning has been a darling of medical and law schools. Each team is carefully composed to ensure its members come from a variety of backgrounds and have different levels of prior knowledge of the subject. A team’s members stay together throughout the course. In class, teams assess and clarify their understanding of out-of-class readings. They apply their understanding in activities that require them to solve significant problems. Students also evaluate their peers’ participation in the team process. For more information on team-based learning, visit the Team Based Learning Collaborative. Based on the work of Dee Fink, this employs “backward design,” which looks at feedback and assessment before designing activities that bring about the desired result. This helps assure “integration,” where all the elements of the course are in alignment and support each other. Examining ways learning can be significant, Fink offers a Bloom-like “Taxonomy of Significant Learning.” It includes six major categories: Foundational Knowledge, Application, Integration, Human Dimension, Caring, and Learning How to Learn. Unlike Bloom's taxonomy, Fink’s is relational, not hierarchical. For more information on Significant Learning, see What is Significant Learning? and A Self-Directed Guide to Designing Courses for Significant Learning. In a contract grading system, the instructor and student agree at the beginning of the course on what grade the student will receive, provided the students meets specific criteria they both agree on and include in a contract they both sign.